Each month, the first three readers to identify the location pictured in the current print version of Geotimes will receive the Glossary of Geology. The first 10 will receive a Where on Earth? T-shirt. To submit photos for future Where on Earth? contests, click here. 1.The fault scarp in the foregroung was formed in the last 20 years by a magnitude-7+ earthquake that killed two people in this sparsely populated region. 2. This 3,900-meter peak, composed of a Silurian and Devonian limestone sequence, is the highest in a range dominated by Mississippian carbonate banks. 3. Root vegetables are a staple of the inhabitants of the region, which was also a favorite haunt of the author of The Snows of Kilimanjaro. 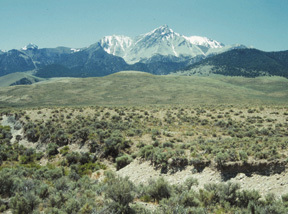 Borah Peak is the highest point in Idaho, a state famous for its potatoes, and is the highest peak in the Lost River Range. It was the site of a magnitude-7.3 earthquake on Oct. 28, 1983 — the largest ever recorded in Idaho. The quake produced extensive surface faulting and landslides. It caused two deaths and $12.5 million in damage in the Idaho towns of Challis and Mackay. David Frank -- Washington, D.C.
Kate Johnson -- Reston, Va.
John Callahan -- Boone, N.C.
Fred Hawkins -- Denver, Colo.
Charlie Sandberg -- Lakewood, Colo.
Joe Michaletz -- Helena, Mont. 1. Grew stands on the edge of a small island sitting on an ice-covered bay. To the south is an approximately 700-meter-high mountain that is part of a coastal range stretching to the continent's edge. The bay leads northwest into an ocean. 2. The island and mountains are composed of regionally metamorphosed, ultra-high-temperature (near 1,000 degrees Celsius) rocks of Archean age, some as old as 3.8 billion years. Certain rocks exposed in the mountains contain sapphirine with quartz and osumilite. The mountain is scarred by post-metamorphic dikes of Proterozoic age. 3. The area is in a region discovered in 1831 by the Englishman John Biscoe. The photo was taken by Chris Carson in Enderby Land, Antarctica. 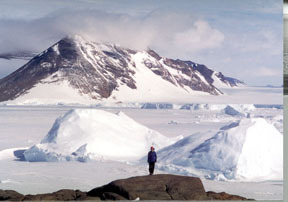 It shows Edward Grew of the University of Maine standing in the foreground and Priestly Peak and Amundsen Bay in the background. The location is about 50 miles southwest of Mount Biscoe and Cape Ann. Charlie Bentley -- Univerity of Wisconsin, Madison, Wisc. Rusty Dersch -- U.S. Forest Service, Lakewood, Colo.
Curtis Hudak -- Stillwater, Minn.
Jeffrey Kirtland -- Seattle, Wash.
Venkat Raman -- Columbus, Ohio. Please consider submitting your own field shots for possible publication in "Where on Earth?" All photos will be returned. If we run your photo in Geotimes, you'll receive a free one-year subscription or renewal. Mail photographs, slides or electronic files on disk to Geotimes, 4220 King Street, Alexandria, VA 22302. Please contact Geotimes via e-mail at geotimes@agiweb.org for electronic submissions and FTP instructions.